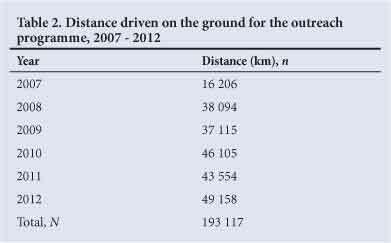 Surgical outreach in rural South Africa: Are we managing to impart surgical skills? BACKGROUND: The Department of Health in KwaZulu-Natal (KZN) has run a surgical outreach programme for over a decade. OBJECTIVE: To quantify the impact of the outreach programme by analysing its effect on the operative capacity of a single rural health district. METHODS: During 2012, investigators visited each district hospital in Sisonke Health District (SHD), KZN, to quantify surgery undertaken by resident staff between 1998 and 2013. Investigators also reviewed the operative registers of the four district hospitals in SHD for a 6-month period (March - August 2012) to document the surgery performed at each hospital. The number of staff who attended specialist-based teaching was recorded in an attempt to measure the impact of each visit. RESULTS: From 1998 to 2013, 35 385 patients were seen at 1 453 clinics, 5 199 operations were performed and 1 357 patients were referred to regional hospitals. A total of 3 027 staff attended teaching ward rounds and teaching sessions. In the four district hospitals, 2 160 operations were performed in the 6-month period. There were 653 non-obstetric operations and the obstetric cases comprised 1 094 caesarean sections, 55 sterilisations and 370 evacuations of the uterus. CONCLUSION: The infrastructure is well established and the outreach programme is well run and reliable. The clinical outputs of the programme are significant. However, the impact of this programme on specific outcomes is less certain. This raises the question of the future strategic choices that need to be made in our attempts to improve access to surgical care. It has been estimated that just over 10% of the global burden of disease requires surgical treatment. However, access to surgical services is unevenly distributed across the world and across regions within the same country. [1-6] Currently, less than one-third of the estimated 234 million operations that take place each year are performed in the developing world. Lack of access to surgical services results in significant morbidity and mortality. Strategies to improve access to surgical services focus on improving the surgical capacity of district hospitals. The Bellagio Essential Surgery Group (BESG) and the World Health Organization (WHO) recommend that services at the district hospital level be strengthened by ongoing surgical training. [7-9] One strategy to achieve this is to take surgical expertise to the district hospitals with the aim of delivering clinical care and imparting surgical skills - known as the surgical outreach programme. [10-14] The Department of Health (DoH) in KwaZulu-Natal (KZN) has run such a programme since the turn of the millennium. The programme is co-ordinated by the staff of the Red Cross, based initially at the old Durban International Airport and now at King Shaka International Airport, north of Durban. The programme makes use of fixed-wing aircraft to visit the more remote district hospitals in the KZN Province and ground transport to visit the more geographically accessible hospitals. Surgical consultants from Pietermaritzburg and Durban are transported to each hospital in the province on a monthly basis. When available, anaesthetists accompany the visiting surgeons. This audit reviews the outreach programme and attempts to quantify its impact by analysing the operative capacity of the rural Sisonke Health District (SHD). KZN lies on the east coast of South Africa (SA) and consists of three broad regions, the urbanised coastal area around Durban, the western, inland part, stretching from the coast westwards to the Drakensberg mountains and the northern area which extends up to the border with Mozambique in the north, and westwards to Mpumalanga Province and Swaziland. There are 70 provincial hospitals, two central hospitals, two tertiary hospitals and six regional hospitals in KZN. Both central hospitals and two regional hospitals are in the eThekwini Metropolitan Municipality. The coastal area is highly urbanised and has two other regional hospitals. The inland area has the single city of Pietermaritzburg with a well-developed infrastructure, a tertiary hospital and three regional hospitals. However, the western part of the province is predominantly rural, while the northern region is remote and deeply rural. The urban centre serving the north is the least developed of the three urban conurbations and is centred on the towns of Richards Bay and Empangeni. There is a single tertiary hospital serving the northern part of the province. The population of KZN is approximately 11 million, with half the population living in the rural areas outside the three conurbations of Durban, Pietermaritzburg and Empangeni/Richards Bay. SHD is a rural area in south-western KZN with a population of roughly 500 000 people. Edendale Hospital in Pietermaritzburg serves as the regional referral hospital for the four district hospitals in SHD. Each district hospital is visited once a month by a surgical specialist from Edendale Hospital. KZN thus has a large rural population living in relatively remote areas that are poorly served by transport infrastructure and far from surgical services. The South African Red Cross Air Mercy Service (AMS) is a non-profit organisation that focuses on health support and the upliftment of local communities through health initiatives. In KZN it has two helicopters and one fixed-wing aircraft dedicated to emergency services, two fixed-wing aircraft dedicated to the surgical outreach programme and one vehicle based in Pietermaritzburg and dedicated to the ground-based outreach. The operational costs of the programme are borne by the DoH. The flying doctor outreach programme has run since 1998 and in 2007 was supplemented with a 'drive clinic' intended to support areas that could not be reached by air. Doctors and healthcare workers travel daily to the outlying healthcare facilities to assist with clinical consultations, to undertake teaching ward rounds and to perform operations. The following specialist surgical departments at the School of Clinical Medicine, University of KwaZulu-Natal (UKZN) contribute to the programme: General Surgery, Ophthalmology, Orthopaedics, Plastic Surgery and Ear, Nose and Throat (ENT) Surgery. Visits are structured not only to focus on the delivery of clinical care, but to implement ongoing quality improvement initiatives by building clinical governance structures and imparting clinical skills. Each visit attempts to address the following objectives: clinical care by means of a ward round and a dedicated outpatient clinic, clinical teaching, and an operative list. Quality control and clinical governance initiatives are developed by assisting with morbidity and mortality meetings while system and infrastructure development is facilitated by undertaking needs assessments in each hospital. As far as possible, all staff at the district hospitals are directly involved in the outreach visits. This audit of the past 12 years of the outreach programme documents the activities of outreach staff and assesses the impact of the programme by auditing the surgical output within a single health district (Sisonke) to determine whether surgical (and anaesthetic) skills have been imparted. The AMS staff maintained a log of all flights from the base in Durban. Details of the number of specialist visits undertaken both by air and land transport were captured. Data recorded for each visit included the number of patients seen, the number of operations done and the number of patients transferred to the referral centre. The number of staff who attended specialist-based teaching was recorded in an attempt to qualitatively measure the impact of the visit. During 2012 the investigators visited each district hospital in SHD to quantify the operations undertaken by resident staff at those hospitals between 1993 and 2012. Surgical registers were reviewed for the period between March 2012 and August 2012. The following obstetric procedures were recorded: caesarean section, evacuation of the uterus, and sterilisation. Orthopaedic and general surgical cases were categorised thus: orthopaedic reduction and amputation, hernia repair, laparotomy and split skin graft and ophthalmological procedure. All other cases were classified as miscellaneous. From 1998 to 2013, 35 385 patients were seen at 1 453 clinics; 5 199 operations were performed and 1 357 patients were referred to regional hospitals. A total of 3 027 staff attended teaching ward rounds and teaching sessions. 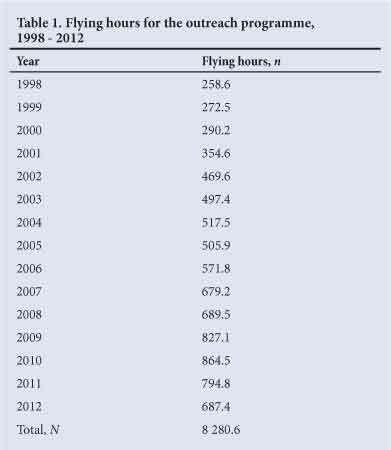 Tables 1 and 2 summarise the number of flying hours for each year and kilometres travelled each year. The Department of Surgery, UKZN visited 24 hospitals and conducted 332 clinics at which 4 456 patients were seen. A total of 235 patients were referred, 668 operations performed and 2 462 doctors and nursing staff trained. Staff of the Department of Plastic Surgery, UKZN visited eight hospitals, conducted 83 clinics, saw 915 patients, performed 144 operations and trained 31 doctors. Staff of the Department of Orthopaedic Surgery, UKZN visited 21 hospitals and conducted 427 clinics at which they saw 12 438 patients. A total of 519 surgical procedures were performed and 161 doctors and nursing staff were trained. Staff of the Department of ENT Surgery, UKZN visited 22 hospitals and conducted 215 clinics; 10 316 patients were seen, of whom 939 were referred; 329 procedures were performed and 242 doctors and nursing staff trained. A total of 28 hospitals were visited by staff of the Department of Anaesthetics, UKZN who conducted 270 clinics. They administered 880 general anaesthetics and 131 doctors and nursing staff were trained. Review of the surgical registers at the four district hospitals in SHD revealed that 2 160 operations were performed. There were 653 non-obstetric operations including 58 orthopaedic reductions and amputations, 68 ophthalmology operations, 11 laparotomies, 1 split skin graft, 1 abdominal wall hernia repair and 537 miscellaneous operations. The obstetric cases comprised 1 094 caesarean sections, 55 sterilisations and 370 evacuations of the uterus. These data are summarised in Table 3. The BESG recommended that access to surgical care be increased by strengthening services at the district hospital level through enhanced surgical training programmes. [7-9] Such surgical outreach programmes, if not well planned, may merely deplete the regional referral hospital of skills and expertise and be of little benefit to the district hospital. It is essential to assess both the outputs and the outcomes of such programmes and audit their results. Outputs are generally quantifiable and include easily captured metrics such as the number of patients seen and number of operations performed. Outcomes are more difficult to measure. This report documents the outputs of the outreach system but acknowledges the difficulty with regard to precise measurement of outcomes. The WHO in Surgical Care at the District Hospital states that basic abdominal surgery should be undertaken at district hospitals. Although the exact definition of basic abdominal surgery is unspecified, the following procedures are listed: laparotomy for trauma, laparotomy for the diagnosis and management of intestinal obstruction, peritonitis, complicated peptic ulcer disease and appendicitis. The following trauma procedures are described: splenectomy, packing of liver lacerations, small bowel repair, intestinal anastomosis, fashioning of a colostomy, and repair of a ruptured bladder. There is a chapter that describes the diagnosis and management of the following surgical conditions: small bowel obstruction, complicated peptic ulcer disease, as well as the technique of open cholecystectomy for complicated gallbladder disease, non-surgical management of sigmoid volvulus and the surgical management of inguinal hernias, femoral hernias and umbilical hernias. Our review of the operative data in SHD suggests that, despite an active surgical outreach programme, there remains a significant gap between the range of surgeries the WHO believes should be performed in a district hospital and what is actually delivered within SHD hospitals. Nevertheless, in terms of the numbers of patients seen, and the large number of operations performed, potential congestion at regional and tertiary hospitals over the 12-year period would have been significantly mitigated. Our results are similar to those published by Voss and Duvenage who audited the surgical output of seven district hospitals in the rural Western Cape. The volume of general surgical procedures undertaken is low and almost no abdominal surgery is undertaken. In their year-long review only 21 appendicectomies were performed (19 in one hospital, 2 in another) at the seven referral hospitals! The situation is similar in SHD and we have reported on the poor outcome of acute appendicitis in our environment. The WHO defines a high priority procedure as one which primarily addresses emergencies such as injuries and obstetric complications. These procedures include laparotomies for trauma and acute abdominal conditions as well as open reduction of fractures, split skin graft and abdominal hernia repair. In our study there was a very low rate of abdominal hernia repair, split skin graft and laparotomy. A large number of smaller miscellaneous procedures are performed that included incision and drainage of abscesses, biopsy and excision of cutaneous and sub-cutaneous lesions and suturing of wounds. Our findings are in keeping with data reported from a review of the unmet surgical need in sub-Saharan Africa. [2,3] It would appear that in the region as a whole, caesarean section is the most commonly performed operation and despite a high prevalence of trauma, burns and intestinal obstruction in the region, the number of fracture reductions, laparotomies and skin grafts is small. Most of the procedures performed are in the so-called miscellaneous category and include incision and drainage of abscesses and wound management and suturing, many of which, if performed in the outpatient department, would not have been formally recorded in the surgical registers. Surgical outreach is proposed as a strategy to increase the surgical output of district hospitals. Although our programme has succeeded in delivering point-of-care need it has been less successful in building operative capacity. This raises specific questions as to the way forward for rural surgical care in SA. The strategic options are to continue working to build up district level surgical capacity by means of enhanced training programmes - involving a fairly massive investment in human resource development - or to deliberately bypass the district system for pathologies requiring surgery, in favour of referral to regional centres with comprehensive surgical capacity. The DoH has run an active surgical outreach programme for more than a decade. The infrastructure is well established and the programme is well mananged and reliable, and the clinical outputs are significant. However, the impact on strengthening surgical and anaesthetic capacities, which were key objectives, is less certain. Our audit suggests that the outreach programme has not succeeded in transferring surgical skills to the staff of the district hospitals. This raises the question of which future strategic choices need to be made to improve rural patients' access to surgical care? Acknowledgement. Jerusha Dorasamay from the AMS helped to collate the details of the AMS visits.